Soy is the leggings-as-pants of the food world — people either love it or they hate it. What really makes it stand out more than, it seems, any other food is that the evidence for and against its effect on your health is all over the place. “Soy is definitely a very controversial topic,” says Sara Vance, C.N., a nutritionist in San Diego and founder of Rebalance Life. “On the one hand, you have groups touting the health benefits — that it’s a low-calorie, complete source of protein, it can help reduce cholesterol and heart disease risk, and some studies have even found that the isoflavones in soy have anti-cancer benefits.” The result: Good things are said about soy, so people flood their diet with it. 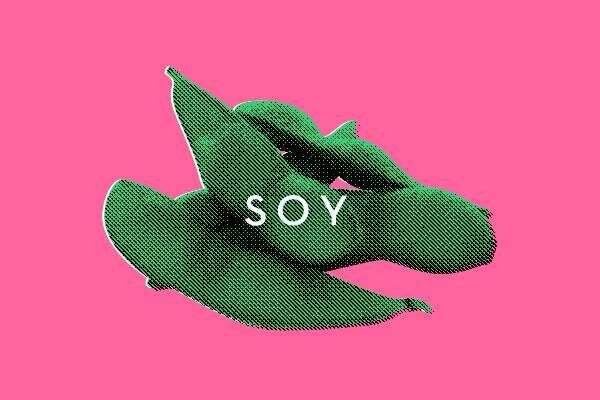 Let's take things back to the basics for a second — namely, what is soy, exactly? “Soy comes from the soybean plant — it’s a legume but actually considered an oilseed — and it’s rich in protein and fiber, as well as isoflavones, powerful antioxidants,” says Shapiro. So that yummy edamame app you're so fond of at your local sushi joint is basically a soybean in its purest form. It’s once you venture outside of that into the more processed foods that soy’s nutritional value typically starts to decline, she says. The exceptions, besides actual soybeans and fresh tofu, are the fermented versions such as miso, tempeh, soy sauce, and tamari. So, what's all the fuss about? It's just a bean from a plant — how bad could it really be? Well, once you start ingesting an excessive amount of it, soy's not-so-great side pops up. And it’s easy to OD on soy and not even know it. The more processed foods you’ve got in your pantry, the more soy you are eating. “Soy is a cheap source of protein for many packaged and processed foods, so if you are eating protein bars, cereals, bottled dressings, mayonnaise, vegan meat substitutes, and fast foods, you are probably consuming soy,” says Vance. You’d be surprised by how many different forms that it can come in — you'll be able to identify it on a label as soy oil, soy protein isolates, soy protein, soy lecithin, and textured vegetable protein (TVP), among others. Finally, soy is one of the most genetically modified foods (along with corn). “Unless it says non-GMO, or organic, it is safe to assume it is probably GMO soy,” says Vance. And when it comes to soy milk, make sure it’s unsweetened. “Only when it’s unsweetened are there less calories than regular milk, or skim,” says Shapiro. “When you add in all that sugar, it’s a whole new ball game nutritionally and not beneficial from a health or diet perspective.” Vance isn't a big fan of soy milk in general, noting that there are plenty of other dairy alternatives out there that won't put you at risk. She likes almond, coconut, or flax milk to drink, and So Delicious Coconut Milk Creamer for your coffee. The bottom line: soy, in its purest form (edamame) can be a stellar source of protein and fiber, and having a splash of non-GMO plain soy milk in your coffee is no biggie, but enjoy your soy in moderation. (And, read the labels!) Being educated and aware of where and when the not-so-healthy versions of soy are lurking in your foods is the only way to truly know the source — and amount —in your diet.